Heinrich Zille came from a poor family that moved to Berlin in 1867. He was trained to be a lithographer and in the evenings he was an apprentice to the painter Theodor Hosemann. After his studies he worked as a lithographer with the Photographischen Gesellschaft in Berlin. He served in the army (1880-1882) and he married married Hulda Frieske, the daughter of a teacher, in 1883. In 1901 his work was exhibited at the Berliner Secession and he published his drawings in the "Simplicissimus" and "Jugend" magazines. In 1903 he became a member of the Berliner Secession. In 1907 was fired by the Photographischen Gesellschaft and now he worked as a free artist. He published several volumes of his work in which he often portrayed the working classes of Berlin in a loving way. In 1919 his wife died. In 1924 Zille became a member of the Academy of Art thanks to Max Liebermann. In 1928 his seventieth birthday was surrounded with festivities. He was a very popular man now and there was a retrospective of his work at the Märkischen Museum in Berlin. Only after his death in 1929 he was recognized as a photographer. 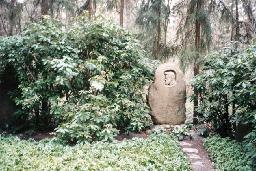 The grave of Heinrich Zille at the Südwestfriedhof, Stahnsdorf, Berlin.